CIL EDs: NCIL’s Veterans Subcommittee Needs Your Input! The NCIL Veterans Subcommittee and our friends at APRIL are working on a strategy to engage Centers for Independent Living and help provide resources to CILs about legislation affecting Veterans with disabilities, education and opportunities to work with Veterans, and how CILs can be involved with state partners in working with Veterans. We are seeking your input as a Center Director on how you are currently working with Veterans. Veterans Subcommittee Calling All Members! November 11, 2015 was Veterans Day, and many of us paused to pay tribute to the veterans who have served our country and the sacrifice of these individuals and their families. 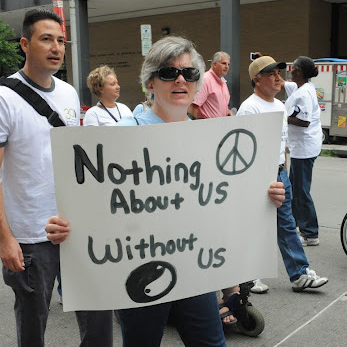 Many NCIL members know that veterans have not always been honored as they are in 2015. It might be hard for some to understand that there have been times when we did not honor the lives of those who gave to their country: Vietnam veterans who were treated as enemies upon their return to the U.S., women who were not fully recognized as Veterans and were not eligible for Veteran benefits until after WWII, and veterans of color. We invite you, as NCIL members, to work on the NCIL Veterans Subcommittee to ensure that veterans are not only honored, but that their Independent Living needs are supported. There is a lot of work to be done, especially as Congress looks to gut the budget. In 2015, we hear speeches and grandstanding about our veteran community from politicians, but when it comes down to policy and supporting our veterans, policy-makers are lacking in action. The NCIL Veterans Subcommittee is comprised of veterans who have disabilities and allies in disability rights to bring forward our community’s important policy issues. A lot of members joined the Subcommittee’s meetings in August, but for the past few months attendance has been very low. We are looking for members who are able to spend time on committee work. If you are interested in joining the Subcommittee, you must be a NCIL individual member and have time to contribute to the Subcommittee. If interested, contact Co-Chairs: Sarah Launderville at slaunderville@vcil.org and Mark Derry at adamarkd@aol.com. Our next meeting is scheduled for Monday, January 11, 2016. John Johnson, NCIL Veterans Subcommittee Co-Chair, recently attended and presented at the national AgrAbility Training Conference. Twenty six states were represented at the conference. John participated in a session called un-conferencing, the topic of which was working effectively with veterans. In an un-conferencing session, a topic and facilitator is provided and participants determine what is discussed and shared during the session. AgrAbility programs in our nation deal with farmers, farming, ag business and rural communities, and how to serve and interact with persons with disabilities who live and work in that venue. How do we find veterans in our state? How do we reach veterans in our state? In January of 2014, the NCIL Veterans Subcommittee posted an online survey to gather some basic data on serving Veterans. While we are still collecting data, here are some results thus far. 9 CILs reported they track Veterans, but include I&Rs in their total. 3 CILs reported they serve Veterans but do not separately track Veterans-served. While this is a small sampling, it shows CILs are providing services to Veterans. As new data is submitted, the summary will be updated. CILs are providing a variety of services for Veterans based on local need, in collaboration with state and federal veteran agencies, working with local county Veteran Service Officers, VFWs, American Legions, and of course the four core IL services. 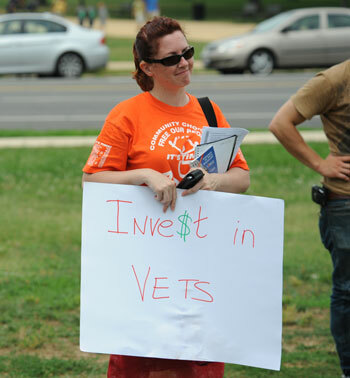 Your Help Requested: Tell NCIL About How You Serve Veterans! In preparation for 2014, the NCIL Veterans Subcommittee undertook an evaluation of itself and its effectiveness to advance veterans’ issues as they relate to independent living and to chart a course for the year and beyond. In doing so, the Subcommittee retained some existing members and added new members. In addition, the Subcommittee has been broadened though collaboration with APRIL (the Association of Programs for Rural Independent Living). NCIL is collaborating with the APRIL Board and membership to establish a joint committee on veterans’ issues, with each entity maintaining their own protocol for membership. One of the goals of the joint committee is to educate the community about CIL services, what CILs may do for veterans, and the CIL definition of independent living services. It is important to note the VA has a cap on the number of veterans who can receive IL services through the VA program, while CILs are limited only by their own resource limits. Community groups that have been contacted include: local county veterans service offices (VSOs), American Legion groups, VFW organizations, and PVA and DAV chapters. In addition, some homeless shelters may have contact with veterans and thus a prospective contact. Some CILs are in contact with both their federal and state legislators, especially those with direct involvement in veterans’ issues, and are making them aware of CIL services to veterans. These discussions are well received by legislators because there is increasing recognition and acknowledgement of the need for community-based services for veterans. The joint committee members believe CILs are providing more services to veterans than is generally accounted for. Several committee members have participated in multiple NCIL and APRIL workshops on veterans’ issues to discuss and learn more about IL services being provided to veterans by CILs. In order to effectively tell our story, the APRIL / NCIL Vets Joint Committee would like to hear about the work you are doing working with and serving veterans. Note: you do not have to be doing anything with the Department of Veterans Affairs or any state / federal agency that receives state / federal dollars to serve veterans. The NCIL Veterans Subcommittee will share these responses with the joint committee in the hope that the data can be used to ask for more core IL dollars. After all, by providing IL services to Veterans, we are building the capacity of our community and the more resources we have, the more work we can do to ensure that people with disabilities are valued equally and participate fully.